Meet the Staff of Mileground Pre-Owned Motors, Inc.
ED HAS BEEN WITH MILEGROUND PREOWNED MOTORS SINCE WE OPENED IN EARLY 2005. 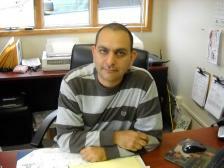 HE WILL MAKE SURE YOU HAVE A ENJOYABLE TRANSACTION HERE AT MILEGROUND MOTORS. ANYTHING THAT HE CAN HELP YOU WITH JUST GIVE HIM A CALL.